We have a century-old tradition to employ domestic aide in Bangladesh. Normally children belonging to poor families are compelled to work as domestic aides chiefly due to poverty and natural calamities. Child Domestic Labour (CDL) force forms the largest portion of the informal child labour sector and simply the single most key source of child exploitation and abuse in the world today. It is a serious violation of human rights and a threat to humanitarian causes all over the globe. It is an emerging gordian knot in the developing countries like ours. It is not just a question of a few thousand, but of several tens of millions of children throughout the world, that are exploited silently within the four walls of home. Not only that, they are employed under such conditions that seriously jeopardise their health, safety, education, morals and dignity. However, before making an attempt to describe different aspects of the plight of the child domestic aide in the light of legal framework in our country, a definitional exploration of the expression CDL is desirable. The term CDL alludes to “situations where children perform domestic tasks in the home of a third party or 'employer' under exploitative conditions (long working hours, with no or little wages, for example, or below the minimum working age)” - a form of 'child labour to be eliminated' as defined in international treaties (ILO:2004). Statutory exclusion, but not practical: The bleak reality prevalent in Bangladesh is that domestic aides are not included in the definition of 'worker' in the Labour Act 2006. 'Domestic aides' are specifically and intentionally excluded from the purview of the Act by section 1(4)(nna) of the said Act. The Act defines a worker in section 2(65) as anyone engaged in any establishment or industry in barter for payment, but does not include those who are engaged in the domestic sector. It is very unfortunate that such service has not been acknowledged by our honorable legislators and so finds not a single place in the labour laws. The consequences of this State negligence are horrendous like they do not enjoy the rights guaranteed by the labour laws to other workers and have no say if they remain unpaid. Besides, they are deprived of redress for violation of conditions of work, leisure, holidays etc. which are the basic assurances of labour laws. In the same way the National Child Policy 2011 is also silent to include the child domestic aide in the definition of workers within the Labour Act. Regarding the employment of children below the age of 14 years in the domestic sector, this policy is not clear as evidenced that children under the age of 14 are prohibited from being engaged in the fulltime employment, but there is no mention as to any age below which a child may not be engaged in domestic working. As a whole, the law and policy, though statutorily, are not ready to term them as 'worker', in reality near to 300,00 child workers are working as domestic aides only in Dhaka city in deplorable conditions in the face of unapologetic exploitation. The National Child Labour Elimination Policy (NCLEP) 2010 also does not clearly show up to what age a child would be totally prohibited from working since it describes that the children under the age of 14 years shall not be employed in regular work. When domestic legislations and policies are averse to include the domestic aide especially child domestic aide within the purview of definition of 'worker', a question must arise that whether the State has any doubt to be cast upon the contribution of these children. I may be wrong in saying that they are the assets of the State. Some people may say that they are simply burden and born for work. 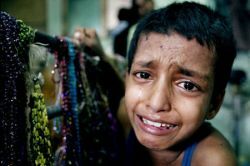 But an ILO study on hazardous child labour in Bangladesh found that more than 40 types of economic activities carried out by the children were hazardous to them. Domestic work with all the hazards of working with dangerous apparatus and fire, as well as working long hours, would be classified as hazardous work, especially when children ages less than 12 years are involved. Nevertheless there is seldom prohibition on employing children at the tender age either in law or in policy. Recent Developments: The Labour Act 2006 is relaxed to some extent by section 44 which provides that a child who has crossed 12 years may be engaged in light work only and there is emphasis on health, security and education of the working child, which cannot be hindered by hook or by cook. Moreover, there is a prohibition under section 34 of the Act employing any child in any profession or establishment, and adolescents, i.e. a child between the age of 14 and 18 years, may be engaged in employment or in an establishment so long he has a certificate from a registered medical practitioner certifying his fitness. This similar provision is embodied in the draft Domestic Worker Protection and Welfare Policy (DWPWP) 2010. The NCLEP 2010 recognizes the provisions and definition of child and child labour within the Act of 2006. It also recognizes the existence of child labour in situations and circumstances other than the establishments and industries and includes the informal sector, amongst other, the domestic work. The policy also recognizes the need to regulate the working hours and wages to be paid to the child aide as well as to ensure the adequate rest, mental and health nutrition, education, and recreation and their working surroundings. It further points out that the domestic children aides are engaged on a fulltime basis and as such their food, recreation and education must be ensured and they must be protected form doing any hazardous work, also they must be protected form physical, mental and sexual torture. Child specialists opine that no child below the age of 12 should be employed in any sector, because that would harm the child's mental, physical and intellectual up gradation. A study done by the Department of Psychiatry and other faculties of the University of Addis Ababa (2006) pointed out that disorders are common in the child domestic aides and they also encounter various types of abuse physically, sexually and emotionally more frequently, all of which are known risk factors or emotional disorders marched towards forced death or committing suicide. Practice of domestic workers' registration: The draft DWPWP 2010 suggests to have a registration authority who will record details of the domestic aides within the local government setup. It can be mentioned that such registration is already in practice in Indonesia and India since 1993 and 2008 respectively. The practical benefit of this registration practice is to trim down trafficking in persons as well as death and disappearance. We have a law under the rubric of the Domestic Servants' Registration Ordinance, 1961 which requires all domestic aides within several police stations of Dhaka district to report for registration with the Office-in-Charge of the respective police station within 15 days of taking up such employment. It is clear that the necessity of registration was felt even at that time, so why not today? Regarding this it is mentionable that the Domestic Violence (Protection and Deterrence) Act of Bangladesh passed in 2010 does not provide specific protection for domestic aides. As domestic workers are parts of the household and equally screened in the confines of the home, so there is no reason why they were and should not be included in the Act of 2010 for the sake of the poor women and children as well as others, who choose domestic labour as a means of livelihood. Supreme Court's standing: Recently the Supreme Court of Bangladesh in BNWLA vs. Cabinet Division, Secretariat, Dhaka and others 17 MLR (HCD) p. 121, delivered ten directions towards the government mainly to strengthened the legal framework in order to include domestic aides within the definition of 'worker' in the Labour Act, 2006 and to ensure all the benefits of regulated working hours, rest, recreation, home-visits, salary, medical check up at least once in every month of all them. Besides, the Court emphasizes on the rights of the child domestic aide such as compulsory primary education mandated under article 17 of our Constitution and equal protection of law in case of domestic violence criminal cases. The unique direction of the Court is allowing them to attend either educational/ vocational training institutes or alternative domestic arrangements suitable to the concerned aide, aiming to get them out of the vicious cycle of poverty and to put up a better set of human resource. The Court also urges upon the establishment of a focal Ministry, Child Labour Units and National Child Labour Welfare Council in order to implement the government policies. If we try to count in number what domestic aides do everything for us that would be really limitless and must be beyond dispute. Sardonically, for all this they are rewarded with little respect, and are treated like untouchables. This behavioral tendency and treatment of us have been focusing the labour legislations to be unenthusiastic to touch them with the hope of minimum equal protection of law! Legal, social, economic and human rights perspectives have to be considered in together. States' obligation to take up some welfare responsibilities vis-à-vis children/ social justice is must. But welfarism is not a solution to regulation as the possibilities for domestic child-exploitation are becoming a usual threat in any state. Law alone cannot tackle the problem of under-age work. That's why we need to ease up our attitude towards them. True, it is not easy to revise a frame of mind that has been leading our lifestyles for ages. But we the human being, we have the insight to value of our values than the other creatures of the planet. Law is nothing but the inner force of social evolution sometimes in the form of revolution. In fine, it's our turn to pick up the right option at least for the angels of human world, whose gala childhood is being stolen.